Parents turned to an Armenian court to settle their dispute over phone bills averaging $862 for a telemarketing service. 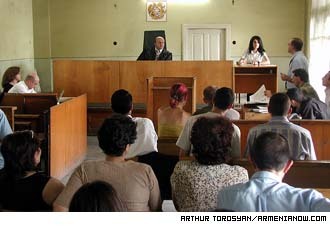 A new telemarketing scheme in Armenia has prompted minors to go to the phones and their parents to go to court. Three months ago ads began appearing on local television, inviting viewers to dial a local number to meet friends, have their fortunes told and play quiz games. Once when I wrote an essay about trying to understand the Genocide, a reader said (warned?) that I was "really becoming Armenian". I suppose it was intended as a compliment. In any case it showed some insight. Miss Armenia, Miss Student, Miss Spring, Miss Summer, Miss Waterpark, Miss Whatever... The culture of such pageants and contests has been actively penetrating Armenia together with other aspects of western culture and it's becoming more and more popular with each day. More than 60 percent of food products in Armenian markets are sold with overdue use by dates and some of them contain potential health risks, according to the recent research of the Armenian Union for the Protection of Consumers' Rights. An adventure-sport competition concluded Sunday (July 13) in Armenia in which 13 teams representing France, the United States and Armenia tested their skills in different parts of the republic. The burning heat of July is made hotter throughout Armenia, as the time of preserving foods has arrived. All across the country men build fires and women stir hot pots, turning summer's harvest into next winter's tasty rewards. Wednesday (July 16) FC Pyunic met with Icelandic title-holders KR Reykjavik in a UEFA Champions League's first qualifying round match in Yerevan at Republican Stadium. In a village near Tsakhkadzor an Armenian burro finds shelter from the Armenian summer.